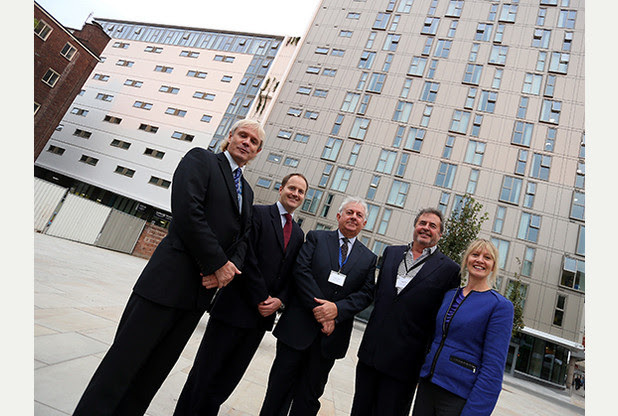 STUDENTS from across the globe have been settling in at a £31m block built in the heart of Nottingham. Last night marked the launch of Global Point residence, a 15-storey tower block built on the former site of the Odeon Cinema off Maid Marian Way. International education company Kaplan, which organise courses for one million students across the globe, was behind the investment. The building provides accommodation for students of Nottingham Trent International College as well as Nottingham Trent University. It was primarily developed for international arrivals, with more than 50 nationalities represented in the block. Anthony Uwaezuoke, 19, from Nigeria, is studying architecture and moved in to Global Point two weeks ago. Collins Oromoni, 22, also from Nigeria and studying internationalbusiness, moved in last week. The building contains more than 440 bedrooms. The cost of a room varies from £129 a week. Among its facilities are a TV room, recreation area and a knowledge hub where tutorials will be held throughout the year. Kaplan managing director Linda Cowan said: “It’s to make sure the students have an incredible experience while they study. “In halls we’re running a lot of support learning for students to do their homework, have debating societies, do group work. Nottingham Trent University pro-vice chancellor Nigel Healey said having a building like Global Point would further the city’s reputation internationally. He said: “Between the two universities we’ve got 12,000 international students - that’s £120m in tuition fees and an additional £120m in terms of what they spend in the city. A Nottingham-based student housing developer is making its debut in Ireland with plans to build a 1,000-bed Dublin portfolio. Mortar Developments has this week lodged plans for a McCrossan O’Rourke Manning Architects-designed €30m (£24m) 232-bed scheme on Dublin’s Church Street. It will be the first of several projects in the city, where Mortar proposes to invest in 1,000 beds by 2016-17. It will also be its first venture outside the UK, where it has a 7,000-bed portfolio. Knight Frank calculated last month that Dublin’s student accommodation sector was in line for €250m of new investment by 2019, to meet a major shortfall in stock. The city is home to 82,818 full-time higher education students, but there are just 2,657 private purpose-built beds. The 232-bedroom development on Dublin's Church Street is currently in the planning stages. It will include a takeaway cafe with outdoor seating, a gym, social space, and a pool room.. Currently, Dublin is home to more than 80,000 full-time students in higher education. But there are fewer than 3,000 purpose-built student bed spaces in the city. The majority of students are forced to rent expensive houses near university campuses while they study. Laura Harmon, President of the Union of Students in Ireland said the student complex on Church Street would be “only the tip of the iceberg” in tackling the overall problem of student accommodation in the city. “It’s my general feeling that [the new development is] a good thing for students. There is an absolute crisis at the minute." “It’s a small way in tackling the problems,” she told Independent.ie. “There’s a huge deficit for student accommodation in Dublin at the moment. The number of incoming students rose by 13 per cent last year, and Ms Harmon believes that the government needs to take action. “There was a 13 per cent rise in incoming students last year. With student numbers in Dublin rising year on year, there is a need for the government to take action." “The estimated cost for one student is around €10,000 per year and with accommodation prices rising it’s a real crisis," Ms Harmon said. “There needs to be a government-led response,” she said. Experts at real estate firm Knight Frank recently revealed their prediction that foreign and Irish investors will invest as much as €250m on student property in Ireland between now and 2019 - as they seek to take advantage of an underdeveloped market. Dublin is said to benefit the most. Mortar Developments is hoping to secure permission to build at Church Street, which is adjacent to Smithfield. The accommodation will include 232 bedrooms, as well as a number of ancillary facilities such as a gym, pool room, cafe and a takeaway. The scheme will involve the construction of a property varying in height between five and seven floors. Co-founded by executive chairman Robert Monk, Mortar Developments has been active in the UK since the early nineties. Mr Monk has extensive property interests in the UK. Mortar Developments has built about 17 large-scale student accommodation facilities - about a dozen of them in Nottingham. It has also constructed two facilities in London. The company's interest in the Dublin student accommodation sector follows attempts by another UK-linked firm to make its debut here. Earlier this year, Anglo-Australian group Urbanest saw its €36m plan for student accommodation on Windmill Lane rejected by An Bord Pleanala. Urbanest had intended to build a scheme in the capital's docklands that would include 313 student bedrooms.